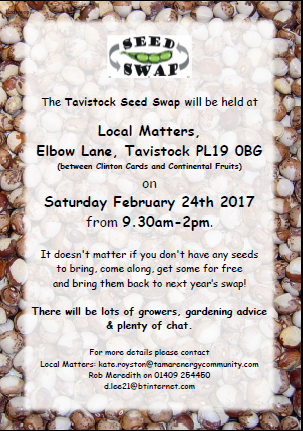 Tavistock Seed Swap returns this year on Saturday February 24th 2018 in Local Matters, Elbow Lane from 09:30 to 14:00. Growers young and old, new this season and ‘seasoned’ growers all welcome. Bring along seeds you have to swop … and have a-grow at something different in 2018. No seeds to bring? Come along anyway, pick up some seeds, have a-grow, and bring your own seeds back next year! 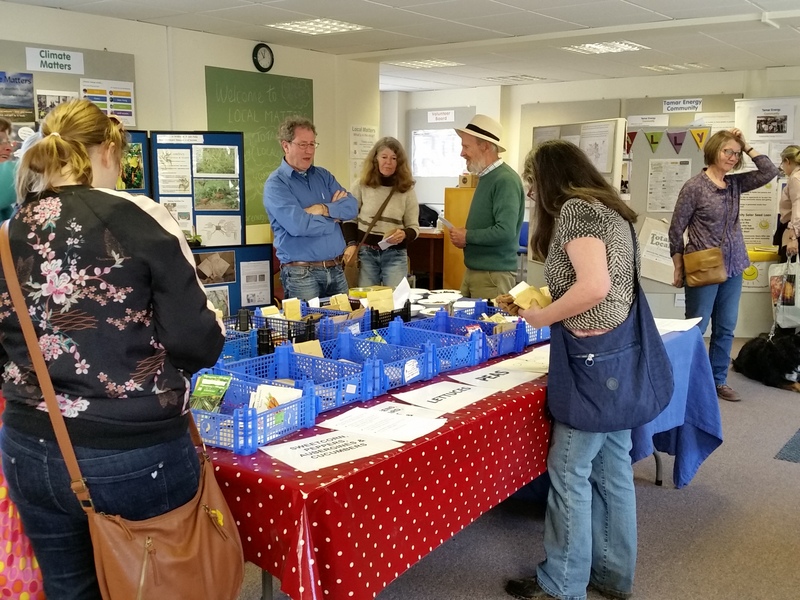 There’ll be lots of growers, gardening advice, plenty of chat … together with tea and cake. We look forward to ‘seeding’ with you. For more details call into Local Matters (11:00 to 13:00 Mon. – Sat), email hello@tamarenergycommunity.com or call Rob Meredith on 01409 254450. This entry was posted in celebrating local food, Events/Meetings, News on February 23, 2018 by Transition Tavistock. Jenny Tunley Price is hosting our Spring Grow Tavi at Maristow Walled Gardenson Thursday 11th April in the early evening (17.30 to 18.00 kick off … we’ll see if we can organise some soup, bread and cakes … any offers?). This entry was posted in celebrating local food, Events/Meetings, News on March 27, 2013 by Transition Tavistock. Tamar Grow Local, Tavistock College and Transition Tavistock are working together to introduce you to Tavistock’s newest producer market together with inspiring presentations and discussions. Cost: No fixed charge although donations will be welcomed! Refreshments: Drinks and home made cakes and biscuits! • Launch of TGL’s new buying group … see how you could benefit … and a chance to sign up! • An opportunity to have a go at food mapping – see just how many local growers and producers there are around Tavistock and the valley! Who have we missed? Please bring along your friends and neighbours. The flyer can be downloaded here – please share with anyone who you think might be interested! We look forward to seeing you there! The 2013 AGM will take place at the Octagon Centre at Tavistock College on Thursday 7th February 2013 from 6.45 pm. We anticipate these formalities to be very short and sweet! Members are allowed to vote. To become a member, or renew membership just pay £1 membership on the door. We will also have copies of the new Transition Free Press for sale (see later article). We are still looking for a Secretary – if anyone is interested in this position, please contact transitiontavistock@gmail.com for further details. It’s a volunteer position requiring just a few hours each month. Also we would like to hear from anyone who could sponsor the copying of our newsletter for those on the mailing list who do not have access to the Internet. Maximum 100 pages copying per month. This entry was posted in celebrating local food, Events/Meetings, News on January 25, 2013 by Transition Tavistock. All welcome – 12:30 to 15:00 – turkey sandwiches and mince pies. Producer stall with local produce. Tamar Grow Local’s Buying Group initiative – would you like to join? General discussion – what’s been happening since last GrowTavi – what’s worked, what not … how can we move forward in 2012 and provide mutual support. Wonnacott Farm is small and traditional, run by the Yells family and tucked away in the Devon countryside (http://www.wonnacottfarm.co.uk/). “We are best known for our traditional Norfolk Black Christmas free-range organic turkeys, but we also produce delicious organic beef from our small herd of South Devon and Aberdeen Angus cattle. From our flock of Charollais, Roussin and Zwartbles sheep we produce organic lamb and mutton together with three natural colours of organic knitting wool. If you think you can make it please drop me a line – kate.royston@transitiontavistock.org.uk or give me a call 07969-569-444. This entry was posted in celebrating local food, Events/Meetings, News on November 6, 2012 by Transition Tavistock. This entry was posted in celebrating local food, News on August 11, 2012 by Transition Tavistock.